Photographs of a Merkava 4 main battle tank (MBT) fitted with a new camouflage system have been uploaded to the internet. Apparently this system is designed to reduce the tank's thermal, near-IR, and UV signature; it will also absorb a major part of the solar energy without transfering most of the heat onto the tank. This results in a lower interior temperature and thus greater crew comfort. The thermal camouflage system is made by the Israeli company Fibrotex. It covers most of the roof area, the gun barrel and the sides of the hull except for a distinctive cut-out section for the engine exhaust vents. The thermal cover appears to have an outer layer made of some cloth-like material which is painted in some form of camouflage pattern in sand color and light brown tones. Thin straps cover the lower hull section at the sides and rear, which are apparently made out of a different material with a rubber-like texture. This material is probably elastic in order to not restrict the tank's mobility - it might in theory even be rubber. Unlike competiting systems such as the Barracuda MCS from SAAB or the Solar Shield system from Rheinmetall, the surface of Fibrotex' material is rather smooth. In certain regions at least this might have a negative impact on the optical camouflaging characteristics of Fibrotex' camouflage design compared to the other system. 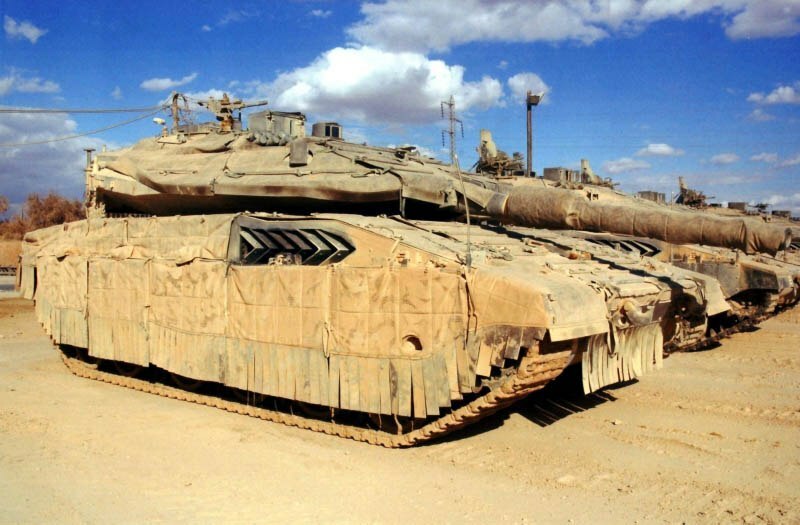 The coverage of the tank also appears to be rather low, which specifically in combination with the camouflage pattern makes the current implementation of the thermal camouflage system on the Merkava 4 somewhat poor at actually hiding the tank. 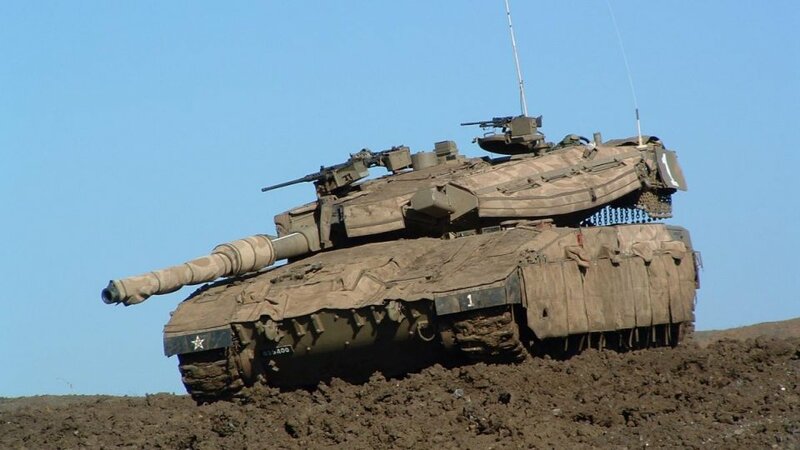 It has to be noted that the current Merkava tank versions as used by the IDF usually do not have any camouflage pattern at all. 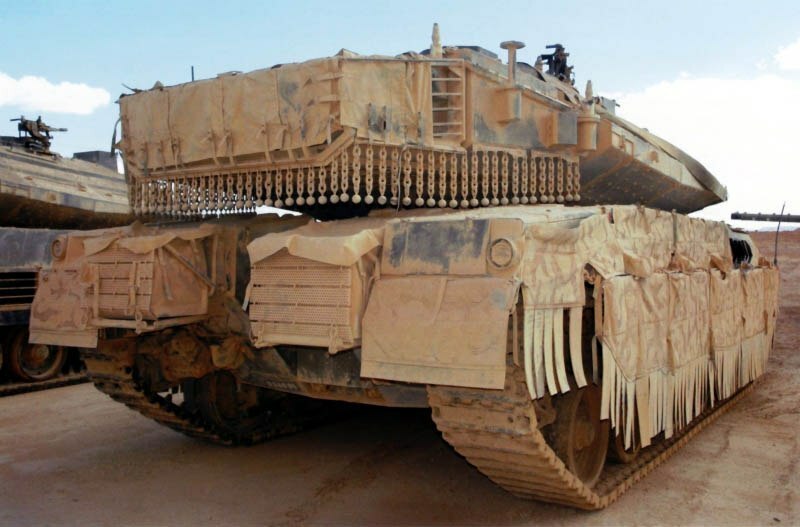 However the website of Fibrotex also includes photographs of another prototype implementation on an upgraded Merkava 3. This appears to have slightly better coverage (but still far from perfect) and a different camouflage pattern with more contrast. Interestingly Fibrotex also offers a thermal camouflage system for the Leopard 2A4, which includes rather thick add-on elements. These appear to be designed to reduce the tank's radar signature, development on this topic was popular in NATO during the mid-1980s. This resulted in a number of stealth demonstrators based on existing tanks such as the AMX-30, Leopard 1 and Chieftain MBT.